Do you want to tone more muscles, burn more calories per mile, and win competitions? Racewalking may be just the sport for you. See how you can achieve high speeds without breaking into a run. Racewalking is not just walking fast or speedwalking. 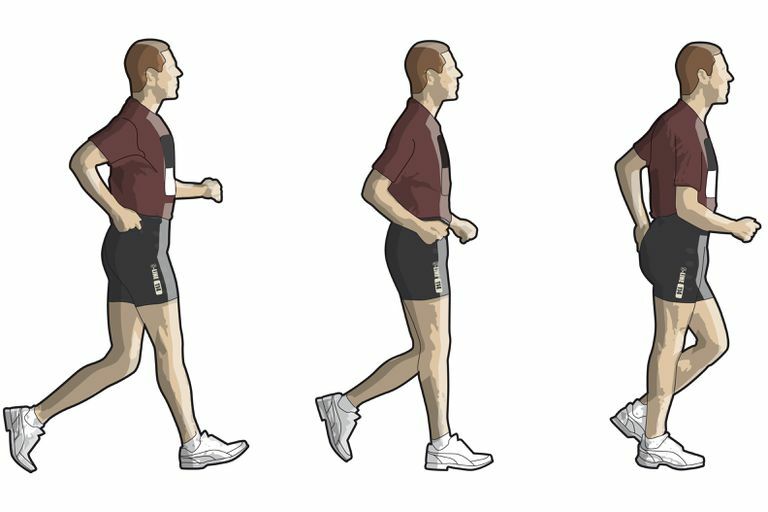 Although a good fast walking technique borrows posture and arm motion from racewalking, it doesn't use the straight leg technique that gives racewalking its hip rotation. You can use the racewalking technique to walk faster in events such as 5K charity runs and half-marathons, even beating many runners to the finish line. But racewalking is its own competitive sport as well. You can win judged races at the local level and, if you are good enough, make the Olympic team. It's not just for the young—racewalking also offers opportunities to compete and to achieve national standing for people of all ages. Racewalking burns more calories per mile than regular walking as the straight leg technique forces you to use more muscles. You might use racewalking as a way to boost the intensity of your walking workouts. It can raise your heart rate from the moderate intensity level to the vigorous intensity level. Racewalking Technique Step by Step: See the technique you use to racewalk. This includes posture, arm motion, and the distinct stride. You must keep your knee straight from the time your forward foot contacts the ground until it passes under your body. You must keep one foot on the ground at all times. This results in the hip rotation that is the hallmark of racewalking. Racewalking Mistakes to Avoid: Mistakes such as violating the lifting and bent knee rules can get you disqualified during a judged race. But you might also simply slow yourself down by using the wrong arm swing, overstriding, or leaning too much. You will need coaching and feedback to learn the correct racewalking technique. It's easy to get it wrong and will take a lot of observed practice to do it right. Use these resources to further your interest in racewalking. Racewalking Books and Videos: Find out more about the basics of racewalking and advanced techniques with books and videos at Racewalk.com. They include full clinics on DVD. These books and videos are very helpful in learning more about the sport. Racewalking Clinics and Coaching: Finding a coach or clinic is essential to learn racewalking. You can search for a racewalking coach on LinkedIn. Coach Dave McGovern offers clinics several times each year around the United States. Racewalking is simply too unnatural of a motion to get right without coaching. Racewalking Clubs: Find racewalking clubs around the world to meet and compete with. Being part of club with regular competitions and being judged for your form is the best way to develop as a racewalker. Plus, you will begin to gather ribbons, medals, and trophies from races. Racewalking is a noble sport with deep roots in track and field competition, including a long history in the Olympic Games. But that doesn't stop modern viewers and commentators from casting aspersions on racewalkers. You can take umbrage, learn to roll with the punches, or leave them in your dust. Walking had its glory days, with kings competing, huge prize money at stake, and actual respect. All of that ended once running took over in the past century. Sports commentators give no respect to Olympic racewalking. Every Summer Olympics they can't resist making snide comments or jokingly setting the women's world record-setting performance to the "Benny Hill" theme music. The fastest marathon and 50K walkers are extreme sports athletes. The standard 50-kilometer distance is several miles longer than the 26.2-mile marathon. However, the sport has also been marred in recent years with doping scandals. Some former champions have been barred from participating or had their Olympic medals stripped from them. Learning to racewalk can add a new high gear to your walking workouts. Explore whether you can get coaching in your area or attend a clinic to learn this Olympic technique.